1. Spread it out. Don't give (or open) all the gifts at once. One a day for each day of Christmas vacation or stashing a away a few for a snow day is a great idea. 2. Clear away toys that your children have out grown and give them to a resale shop. Our local, Nice Twice, resale shop needs these items. Many impoverished families shop there for Christmas. It is completely volunteer run and any money raised goes to provide social services for even more families. Don't just donate your toys, ask if your family can volunteer at a resale shop. They need people to put together puzzles before they are sold (to make sure all the pieces are there.) They need people to carry boxes from storage, hang clothes on hangars, and to price items. Sometimes they need people to cut buttons they can sell off of worn items they can't sell. Help a single Mom or Dad by giving the gift of time. Involve your whole family in inviting their children over for a day or evening of Christmas activities while they get some precious alone time. Buy less and set a limit. If you know your children will get a lot from others then use your funds in other ways or at other times. Start the practice of giving a weekly allowance from which they must make purchases or set up saving accounts for them. The picture is of the 100 Christmas Dinners (2 sacks of groceries, a ham, and a frozen pie) that our church gave out to families this past weekend. 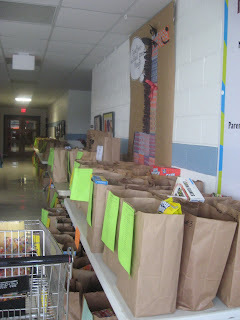 Families of volunteers of all ages packed and sorted and carried... amazing lessons learned.